Typically tahini has oil resting on the top. Take a spoon of knife and give it a very thorough stir so the oil is reincorporated. Measure out the tahini and pour it into a small bowl. Using a fork, whisk in 2 tablespoons of honey and the cocoa powder until everything is completely combined. Add a few pinches of salt and give it a taste. Adjust the honey amount to your liking. If it’s still slightly bitter, pour in an additional tablespoon of honey. Smother this spread on toast or a piece of fruit. 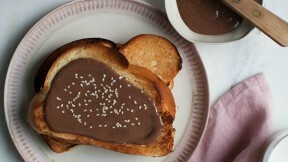 This chocolate spread keeps well in the fridge for up to 2 weeks.